Sara Bush, Sr. Program Manager Microsoft Teams, Microsoft. 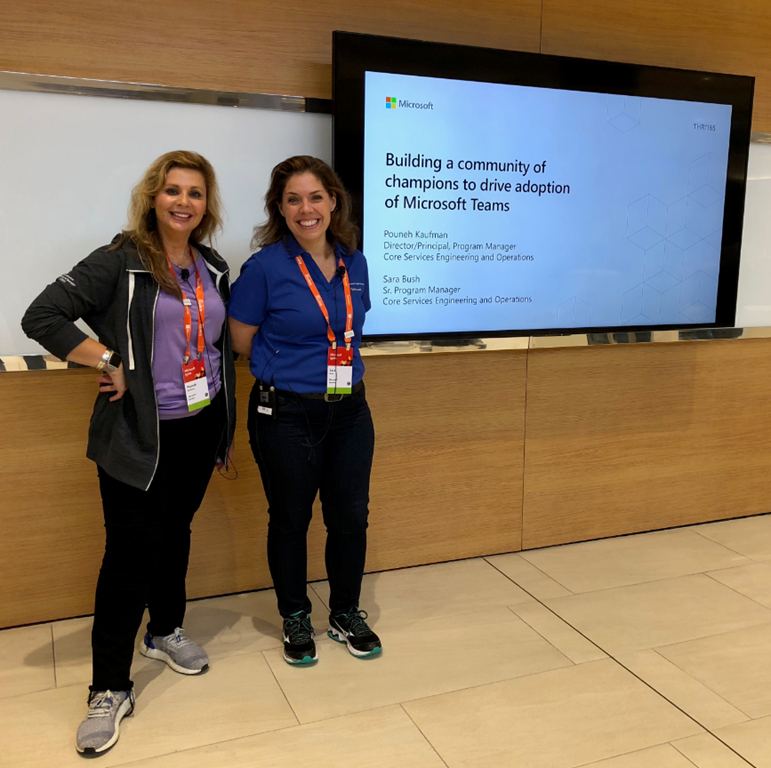 Sara is a member of the Teams & Voice team in End User Services Engineering, Sara is driving Microsoft Teams adoption internally through the Art of Teamwork Tour training program, the Teamwork Champions program and the EUSE change management effort to bring all Microsoft users into a deep understanding of how Microsoft Teams supports day to day work, increasing collaboration and productivity. Pouneh Kaufman, Principal Program Manager, Microsoft. Pouneh is responsible for the global rollout of Microsoft Teams within Microsoft. Every time I have the chance to listen to a session from Microsoft IT I try to attend. It is valuable and gives you good insights, how a worldwide company with more than 220k employees adopt and implement IT. During my projects I see that there is not a lot of difference in IT planning among large enterprises. Microsoft IT shares insights which can be extremely valuable when you use that in your own enterprise. First Sara and Pouneh talked about why Microsoft moved form Skype for Business to Microsoft Teams. 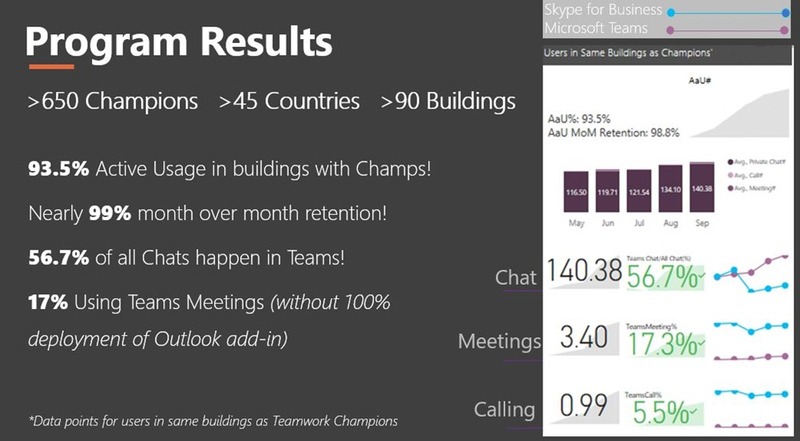 Microsoft Teams helps the organization to get all communication channels together in one place. 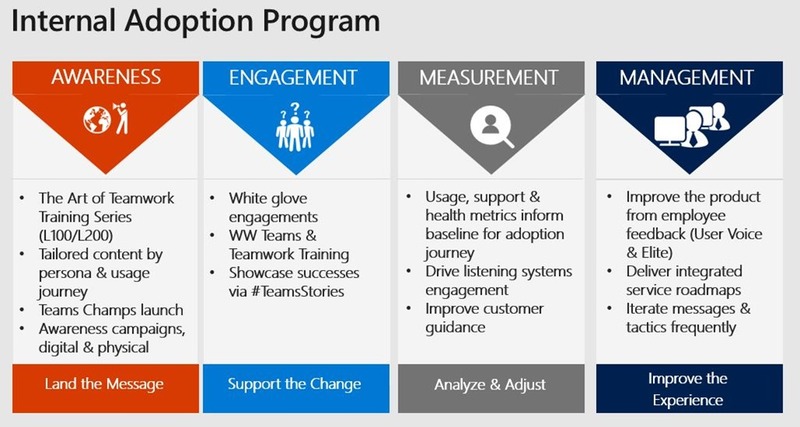 To drive adoption Microsoft IT runs an internal adoption program around awareness, engagement, measurement, management. 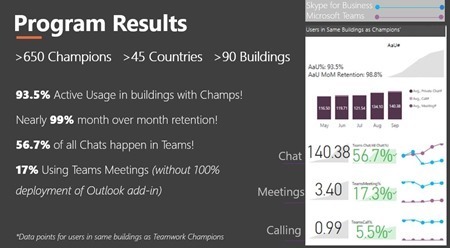 Get more than >200k users to use Microsoft Teams and move away from Skype for Business. over 55% of all chats happen in Teams, Teams meetings are widely used. Champions feedback measurements: 98% Program satisfaction, 88% Satisfaction Training support. 83% Satisfaction with monthly calls. To drive adoption and usage Microsoft IT used a champions program. 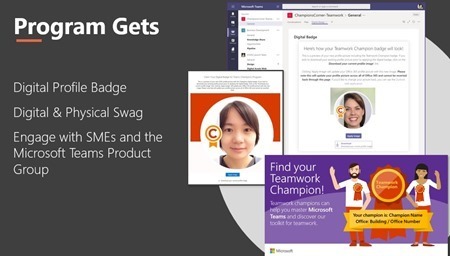 First champs came from passionate users which were found within their most active Teams Yammer participants. People wants to be in the know. 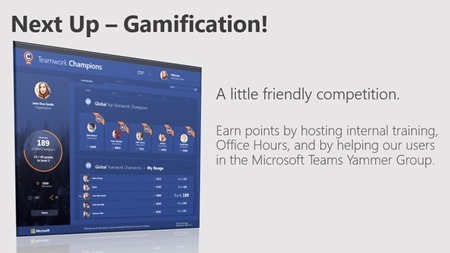 Microsoft IT developed a training: Art of teamwork. It is a level 100 training for end users, which is available to customers as well. More showcases are available here. The best thing about a Champions program: Champions are bringing in other champions. 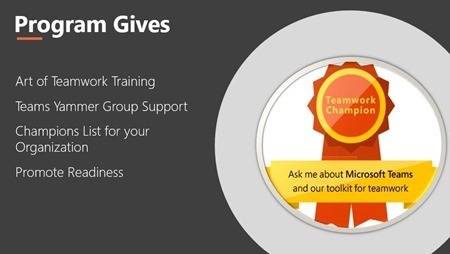 Gives: Teamwork Training. Teams Yammer Group support. Champions List for organization. promote readiness. Gets : Digital Profile Badge, Digital & Physical Swag. Engage with SME’s and the Microsoft Product Group. “I see you, I recognize you, I need you”. access to monthly call with product group. Champions need to be visible to end users. 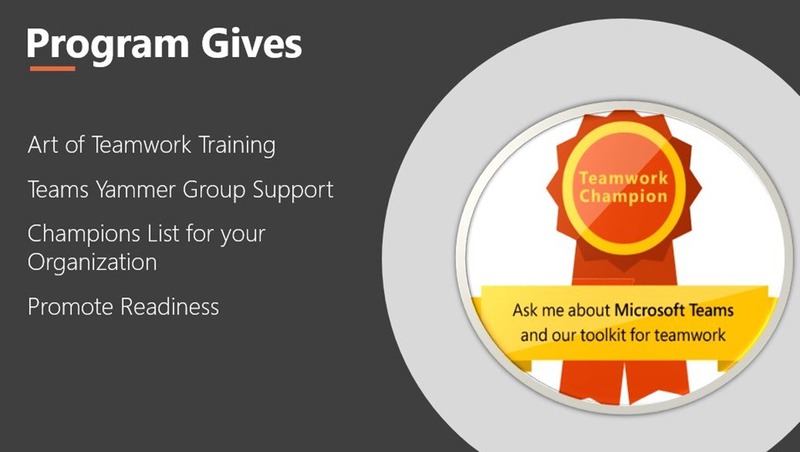 To find champions use the channels which are available – like Microsoft IT used the Yammer group. They make their Champions recognizable. A little friendly competition. 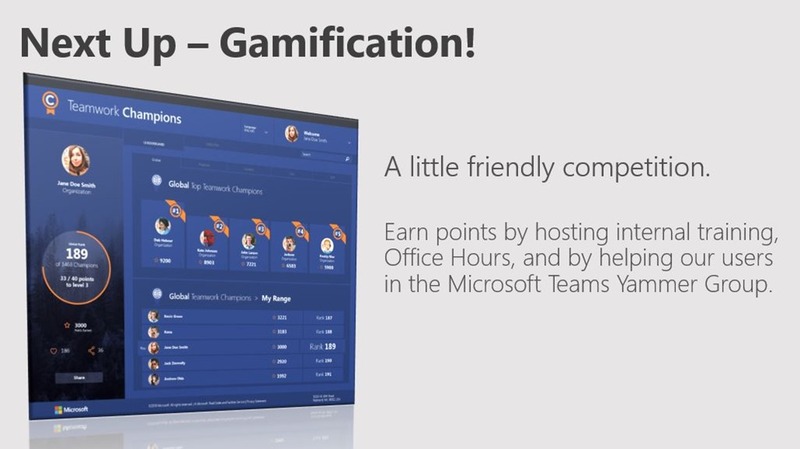 Earn points by hosting internal training. Point system for users development. new badges for new levels. Impacts the performance reviews. What did not work: too much products, different generations, resistance about taking Skype away. Give users a place to talk about that: UserVoice. Yammer community. If you look into bringing a new communication tool into life, look at this usecases!